South Korea’s tech giant Samsung Electronics Co. has extended its global partnership with the International Olympic Committee (IOC) for another 10 years despite growing skepticism over influence of Olympic Games in corporate marketing campaigns. 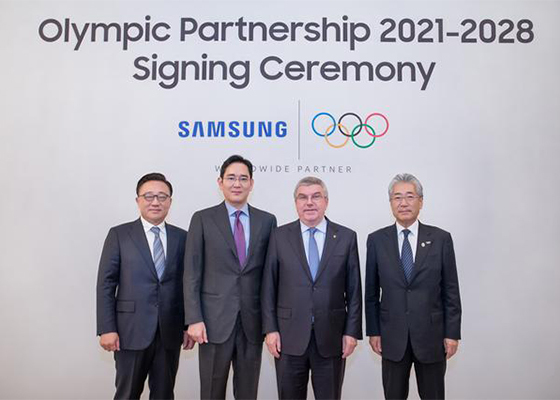 The company said on Tuesday that it held a signing ceremony for the Samsung Electronics-IOC partnership extension through to 2028 in Seoul in the presence of Samsung Electronics Vice Chairman Jay Y. Lee, IOC President Thomas Bach, Samsung Electronics President and CEO Koh Dong-jin, and IOC Marketing Commission Chair Takeda Tsunekazu. Under the extension, Samsung Electronics will continue to play its role as the worldwide Olympic partner in the wireless communications equipment and computing equipment category for not only the Olympic Games Tokyo 2020 but also the Winter Olympics 2022 in Beijing, Summer Olympics 2024 in Paris, 2026 Winter Olympics, and 2028 Summer Olympics in Los Angeles. The host city of the 2026 Winter Olympics has not been named. The partnership extension will lead Samsung Electronics to support the Olympic Games as worldwide partner for 30 years since becoming local sponsor of the Seoul 1988 Olympic Games. The company had signed an agreement with IOC to become Olympic Partner in 1997 and officially supported wireless communications equipment category for the Olympic Winter Games Nagano in 1998. “Through our innovative wireless and computing equipment which are able to support artificial intelligence, virtual reality, augmented reality, and fifth-generation technology, we hope to spread the excitement of the Games so that fans and athletes around the world can stay connected and share in the journey to achieve greatness at the highest level of sportsmanship,” said Samsung President Koh. The partnership extension comes in surprise somewhat amid speculation that the country’s tech mogul had been said to be mulling termination of its IOC partnership upon end of their current agreement, which is effective until the 2020 Summer Olympics in Tokyo. Skepticism has grown about the effectiveness of the Olympic Games in corporate marketing because once the world’s most popular international sports competition has lost many fans. Samsung Electronics is also now one of the world’s most famous electronics companies, a great leap from 20 years ago, requiring less investment in enhancing its brand awareness. Its sibling companies with Samsung logo already have scaled down their sports marketing, reducing their support for sports events or dismantling sports teams with the Samsung badge. But the rapid progress in inter-Korean relations following three summits between South Korean President Moon Jae-in and North Korean leader Kim Jong-un this year might have forced Samsung Electronics to change its stance on Olympic sponsorship, industry observers said. An unnamed official from the business circle said that it could have been a burden for Samsung Electronics to stop its support for the Olympics when there have been growing calls in the political circle and increased social expectations that the company contribute to realizing peace in the Korean peninsula as South and North Korea seek to jointly bid on 2032 Summer Olympics.